RISK-ACADEMY is a trading name, the official company name is International Risk Services Ltd, company registered in Malta, company number C 78608 (date of registration 14 December 2016). 20/1 Republic St, Valletta, VLT 1111, Malta. We operate throughout the world, most of our projects are in Australia (operate under Australian Risk Services), Russia, the Middle East, Europe and Asia (operate under RISK-ACADEMY). Alex Sidorenko is an expert with over 14 years of risk management experience in private equity, sovereign funds, investment authorities and venture capital firms across Australia, Russia, Oman, Poland and Kazakhstan. In 2014 Alex was named the Risk Manager of the Year by the Russian Risk Management Association. Since 2012 Alex runs RISK-ACADEMY, a highly successful company, focused on providing ERM, risk management integration services, risk modeling, training and auditing to private equity firms (direct investment and funds) as well as sovereign wealth funds. Alex’s specialization is risk management integration, risk-based investment decision making, value creation and asset management. Alex was the Head of Risk at one of the largest private equity fund in Russia ($10B assets under management), specialising in hi-tech and nanotechnology across healthcare, information & communications technology, mining, O&G, renewables, semiconductors and utilities. Alex was responsible for running ERM programs at the fund level as well as across its 97 portfolio companies (energy, finance, electronics, pharmaceuticals and manufacturing). Awarded Best ERM Implementation 2014 by the Russian Risk Management Association for his work at RUSNANO and Best risk management education program by the RusRisk in 2013, 2014 and 2015. Prior to that at SKOLKOVO FOUNDATION, Alex lead the risk management function at the largest incubator (multibillion dollar construction) and VC fund and was responsible for risk identification, analysis, mitigation, training and reporting at the management company and the 830 innovation portfolio companies. 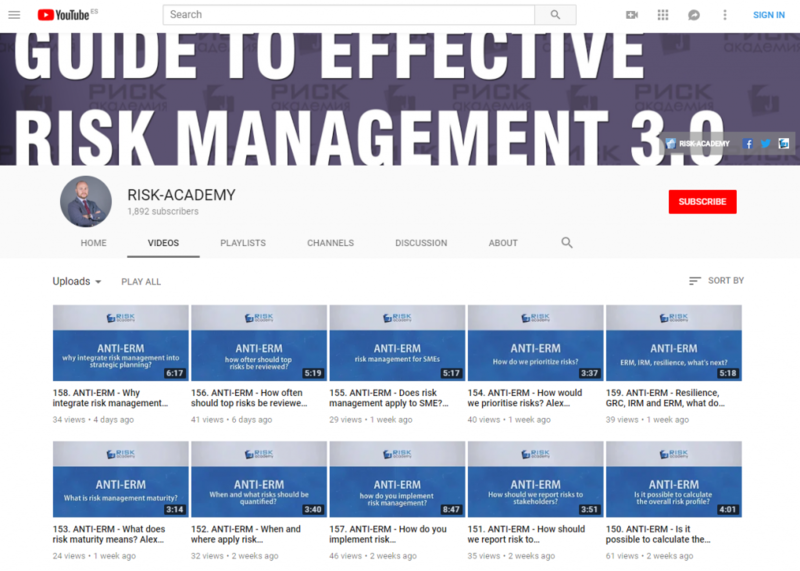 Alex published risk management books in 2011, 2016 and 2017 and is the author of a 12-series TV program dedicated to teaching risk management (second book to be published end 2016). Alex currently lectures at various MBA, Executive MBA programs and executive universities like Gazprom and Russian Rail. More than 8000 executives, managers and students have been trained so far. Alex is Certified Risk Management Professional, RUSRISK and Certified ISO 31000 Risk Management Lead Trainer, G31000. Alex represented Russian risk management community at the ISO Technical Committee 262 responsible for the update of ISO31000:2018 and Guide 73. Paul has worked in risk management for 20 years and tackled numerous projects in Australia and overseas. Typical projects include determining the effects of a fire explosion from oil refineries on the storage of methyl bromide stored at a nearby facility and its potential impact on the surrounding residential community. Assessing the emergency management systems for the General Public from fire and emergency in Melbourne’s Underground City Loop. Paul Camilleri has a Bachelor in Business Finance (Monash University), Post Graduate Risk Management (Swinburne University Faculty of Engineering) and is a Registered Lead Risk Auditor with Exemplar Global. Paul has conducted over 300 Safety audits for major multinational companies and has lead as Group Risk Manager for three years Brambles Australia. Paul is a multi-disciplinary risk consultant and the Principle Auditor of Australian Risk Services.